For many, summertime translates to one thing: festival season. 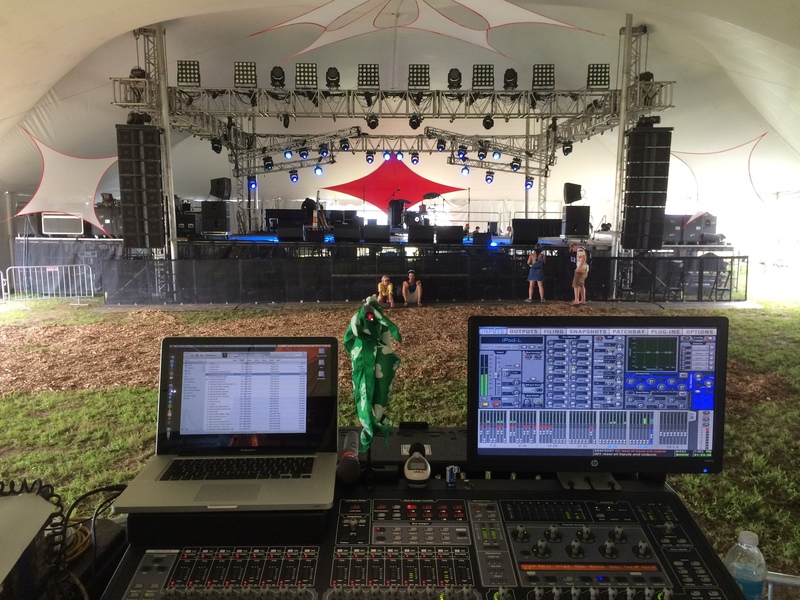 I’ve attended my fair share of festivals as a paid guest, and worked a few smaller, one-off style “festival” events, but this summer presented me with the opportunity to work a stage at one of the more prolific summer music festivals, Wakarusa. 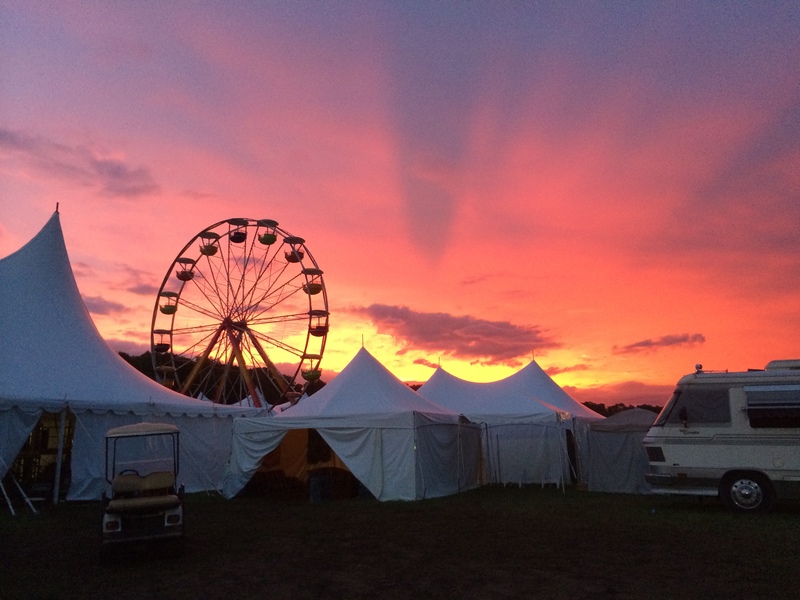 This year marked the 11th year of the Wakarusa Music and Camping Festival, and the 6th year at its current venue atop Mulberry Mountain, just outside of Ozark, Arkansas. 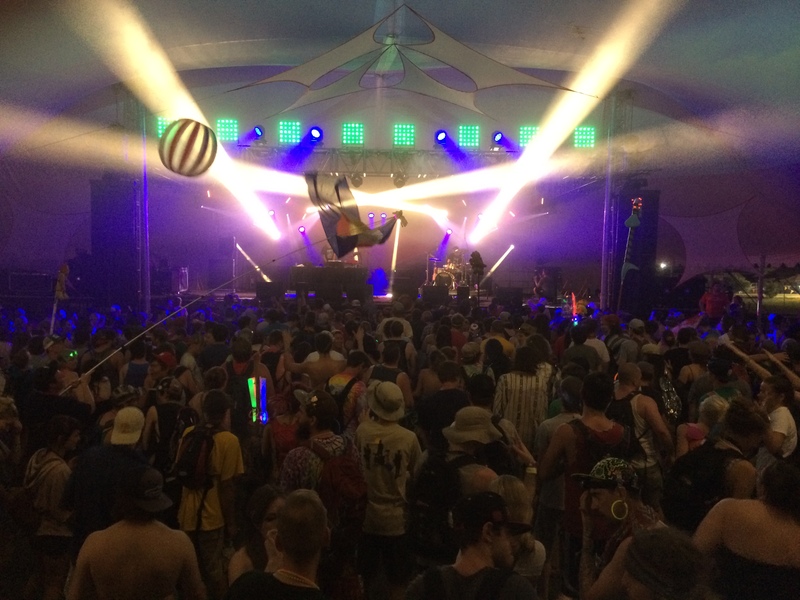 I had attended Wakarusa as a guest a couple times in the past and greatly enjoyed the scenery, variety of musical acts and the quality of production. In those years I always entertained the idea of how great it would be to actually play a part in making the machine tick, but figured those opportunities were often few and far between. Though as they often say in this industry (and, well, every industry), “it’s not always what you know, but you know.” Sure enough, sometime in early May I received a call from a professional acquaintance asking if I was interested in filling an A1/FOH role at Wakarusa’s Outpost stage, for which his company was providing audio. Having been preparing for this moment since entering the industry professionally, I jumped on the opportunity and agreed to cover the gig. The job consisted of a load-in day and three show days with load-out immediately following the conclusion of the final performance. I arrived at load-in to meet my rig for the week: 16 JBL VerTec VT4888 tops, 8 JBL SRX728 subs, a couple of JBL architectural series cabs for front fill, Crown Macro-Tech and iTech power, a pair of dbx DriveRack 4800s and an Avid SC48 digital console (there was plenty of other gear for monitor world, but seeing as my job related to FOH, I’m going to refrain from covering MONS details). Thanks to some hard working stage hands, in about three hours we had the rig flown, snakes run, console tipped and I was ready to make noise (despite having to load in through some soft, semi-muddy ground, which I might add didn’t exactly get any better as the week progressed). At the end of load-in day, lighting guys hard at work focusing. Show days were long. Our stage started loading in the first act around noon each day in preparation for a 2:30PM show time. I was unfamiliar with most of the acts on the bill, and only two of the 18 acts on our stage for the week were traveling with FOH engineers, which left me with the challenge of creating an appropriate, unique and engaging mix for each act in only 30 minute change-overs. 30 minutes to meet a band for the first time, decide what mics to use where/how, interpret what the band’s sound in the house should resemble then make it happen. No problem, it’s what I love doing. There truly is something magical about turning a stage over time and time again, moving from one act to another, with completely different sonic signatures. For this FOH guy, it’s the most fun to be had with clothes on. I lost count of how many times I was behind my console, grinning from ear to ear, proud and thankful that I could lend my abilities to make this event happen. Show day 1, about an hour before the first act took the stage. So the on-stage action kicked off at 2:30PM every day and rolled right along (on-time, I might add) until our scheduled programming ended for the day 4:00AM. I love a stage that runs on time, and again, thanks to our fantastic stage managers, deck hands, and the rest of the behind the scenes staff, we kept every act on-time. Okay, I’ll confess, I think there were one or two acts that started maybe 5 minutes late, but thats a pretty good score if you ask me. When you’re dealing with that many artists, trying to travel to and from the festival grounds among 20-some-thousand attendees, unpredictable weather and all that comes with an event of this scale, it can be a challenge to keep the show running smoothly, but we accomplished exactly that. Break Science as seen during their Thursday night 12:30-2:00AM set. In addition to our audio and stage crew, the lighting team was seriously on-point. Regarding the gear I was tasked to work with, the experience was fantastic. I’ve spent more time mixing on 4888s than any other box, so I know well what to expect from them. Given the proper deployment, processing and power, a VerTec rig can really shine, and that’s exactly what the rig did. The SC48 is also easily my favorite console–it’s fast, ergonomic, takes up relatively little space, sounds good, has lots of flexibility, and probably my favorite feature: you don’t have to look at the screen to use it. Unlike many other digital desks, the SC48 features on-surface displays, pots, switches and faders for nearly every essential function. If you don’t want to look at the screen and dork around with the mouse/trackball, you don’t have to. This is invaluable in such a fast paced setting as this, as every unnecessary movement adds up to wasted time–time you can’t afford to lose without impacting the quality of the show. Back to the PA for a quick note. You’ll notice from the picture above, our trim height was fairly low considering the amount of cabinets we had, and there is a lot of tent material close to the top of the hang. When I first fired up the rig to start tuning, I left all amplifier gains at unity. Each left/right main hang was wired in four zones of two cabinets each. If you’re looking at the hang, zone 1 would be the top two cabinets, cabinets 1 and 2, zone 2 would be cabinets 3 and 4, zone 3 would be cabs 5 and 6 and finally zone 4 was the bottom two cabs, 7 and 8. My first action was to shade back the HF and MF drivers in the bottom zone, to lessen the “rip your face off” effect that comes from standing two feet in front of speaker hang at show volume. The 4888s are a 3-way cabinet–low-mid, high-mid and high. Leaving the low-mid section gained at unity to maintain the low-frequency coupling and pattern control of the array, I experimented with gaining back the high-mid and high frequency sections, first starting with a 3dB reduction, then moving to a 6 dB reduction, eventually settling on -5dB. This helped greatly in reducing the perceived “harshness” if you’re one of the front row show-goers that happens to wind up in front of a hang. Now regarding the top of the hang. Again, if you look at the pictures above, you’ll see the top cabinets are pretty close to tent material on the outsides of the stage grid. With the nominal horizontal dispersion of the 4888 being 90 degrees, there’s no doubt a lot of MF and HF program material exiting those top cabinets is immediately splashing off the tent, causing excessive reflections, smearing and other nasty stuff that doesn’t really help the cause of audio clarity. After lots of walking the room checking for front-to-back coverage and consistency, I opted to completely mute the mid-high and high-frequency sections of zone 1 (the top to cabinets), again leaving the 12″ LF drivers at unity gain to maintain that low-mid coupling, directionality and punch. The difference this made was very significant. Due to the trim heights and grid design, the rig had to be hung in such a way that those top cabinets were just pushing HF over people’s heads anyway, and in stead of taking some system designer’s approach of “well we hung all these boxes, so we better use ’em all,” taking a few minutes to experiment and find out what I really needed to cover the area (and cover it well) greatly improved sound quality. Yes, it’s okay to turn down sometimes. A couple of other notes regarding gear, this was my first time with a set of EV N/DYM 468 microphones. Fantastic for horns, auxiliary percussion and various pieces around a drum kit, I hope to own a few of these soon. Paired with the LP Claw, you can find all sorts of fun, discreet ways to mount these mics in tight places you wouldn’t normally be able to squeeze other options. Also, the original Shure SM91 (SM, not Beta) is almost too easy. When I realized we had one in our mic drawer, it didn’t go away until load-out. With the exception of a few kick drums missing a port-hole (which I managed to make sound pretty good with an Audix D6 on the reso head and the newly beloved N/DYM 468 clawed to the the snare stand pointing where the kick drum beater meets the batter head) the SM91 gave me all the punch and bottom end I could ever want, with, in many cases, zero EQ changes on the channel strip. Of course, all shows must end, as ours did at 4AM on Sunday morning (Saturday night?). Despite not receiving the “fresh” stage hands we were promised, and dealing with a much muddier area than we had for load-in, we got the rig out in a couple of hours, just in time to see a beautiful Ozarks sunrise. Sunrise as seen from behind the Outpost tent. Festival season really is a magical one. Thousands of people from all backgrounds gathering to work, play and perform brings a sense of unity rarely felt at one-offs. If any of my colleagues are reading this, I want to say thank you for everything you did to make this experience educational, fun, successful and truly unforgettable. It’s hard to sum up such an experience in a single blog post, as I could have been writing the entire length of the event and still left out some details, but some things you just have to see for yourself. We worked hard, but don’t worry, we made time for fun, too. 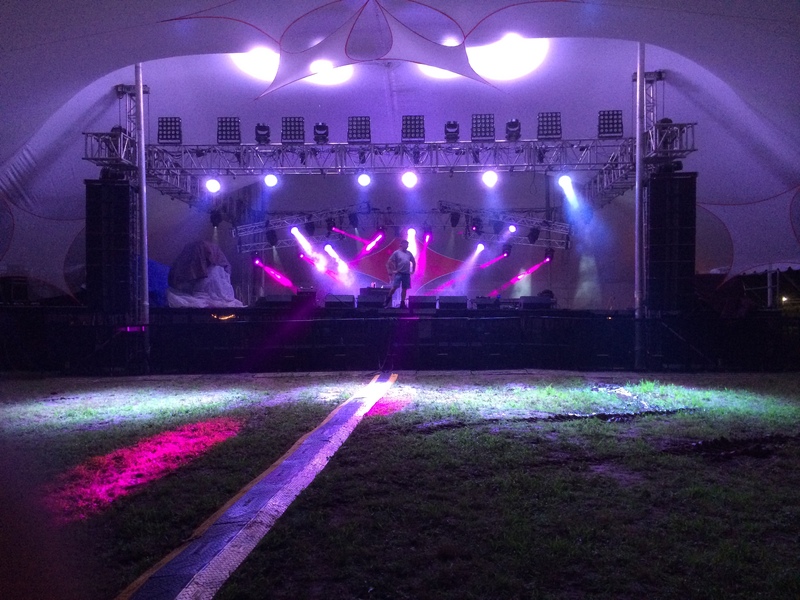 For the annual all-night Relay for Life event at Missouri State University, Southwest Audio-Visual of Springfield Missouri provided staging and sound reinforcement for the dozen or so bands that played throughout the event. With eight JBL VerTec VT4888 line-array boxes and four EAW SB1000z subwoofers, powered by Lab.Gruppen FP10000Q amps, the rig filled the venue nicely. 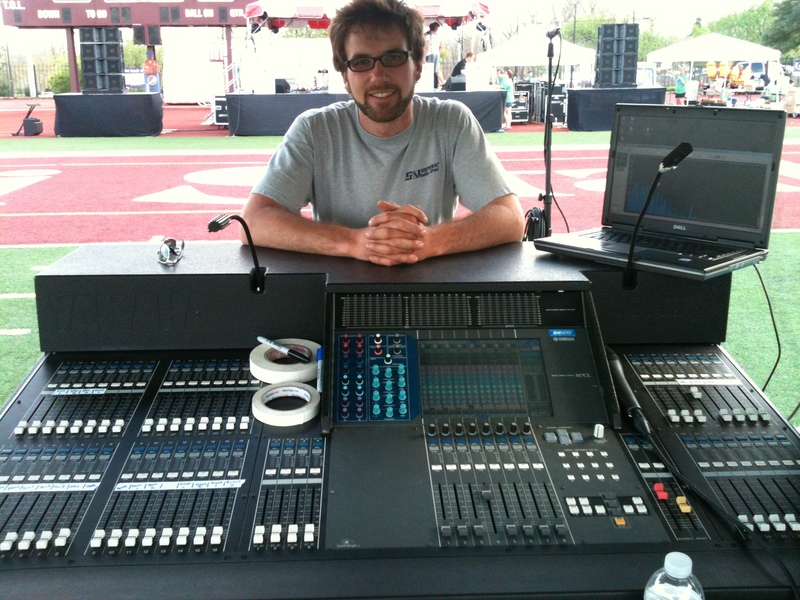 After set-up was completed, I had some free time with the Yamaha M7CL digital console. I’ve only been at the helm a few times, so I’m still getting used to the interface, but find the Yammy to be pretty intuitive.